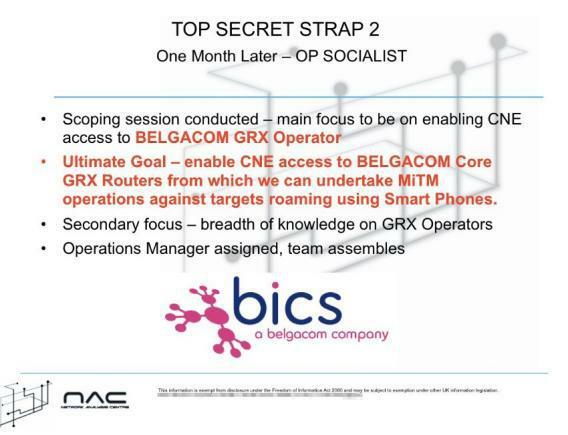 Operation Socialist: U.K.'s GCHQ hacked Belgacom, Snowden documents reveal. “Operation Socialist” sounds like an anti-communist crackdown orchestrated decades ago by J. Edgar Hoover’s FBI. In fact, it was the name of a recent British covert surveillance mission that involved spies hacking into a Belgian phone network, according to newly leaked documents. The secret files, disclosed by former NSA contractor Edward Snowden and published by Der Spiegel Friday, show how the British spy agency GCHQ hatched a plot to infiltrate Belgacom, a partly state-owned Belgian telecom company. Belgacom’s customers, according to Der Spiegel, include institutions like the European Commission, the European Council, and the European Parliament. Earlier this week, the telecom company said that it believed it had been subject to a “digital intrusion” and filed a report with the country’s federal prosecutor. But only now have the details about the spy attack surfaced. The disclosures are yet another illustration of the extremely aggressive scope of the clandestine spy operations that have been conducted by both the United Kingdom and the United States. Infiltration of computer networks is usually more commonly associated with Russian and Chinese government hackers, but the British and Americans are at it, too, even targeting their own allies’ communications. The surveillance tactics appear to have few limits, and while government officials have played up the necessity of the spying for counter-terrorism, it is evident that the snooping is often highly political in nature. It is unclear whether “Operation Socialist” was directed at monitoring left-leaning European politicians or citizens, but that Belgacom was a target at all suggests that the motivation may have been to glean information about officials’ activity in the European Parliament in Brussels. Other recent reports have shown GCHQ has gone after both European Union and United Nations officials and infiltrated government officials’ phones with spyware during a London conference in 2009. The NSA has adopted similar tactics, spying on Brazilian and Mexican leaders’ communications and reportedly hacking Chinese phone networks to monitor text messages.